In today’s day-and-age, we are increasingly dependent on electrical devices for all our comfort needs. Our phones, laptops, TV sets, refrigerators, and air conditioners – among others – have become a crucial part of our life. While some devices help us stay connected to the outside world, certain appliances in the house play the critical role of giving us a comfortable life like washing machines, TV sets, and hair dryer, to name a few. Of course, when we come to the topic of comfort, home lighting is a topic that we simply can’t avoid. We are so technologically advanced that now we can sync up our light with our smartphones to enable a degree of personalisation unlike anything even experienced before. One thing that is common and is required to keep these devices working smoothly and efficiently is electricity. It is in our hands as to how much we consume this valuable commodity. An sudden influx of electricity can lead to a power surge – it happens when the amount of voltage in our electrical devices goes above the safety level. Here are a few pointers detailing out the ways in which you can safeguard your home from any electrical failures and can help in a proper power distribution to sustain the overflow of electricity. Before investing in a surge protector, consult a licensed electrician. Think about the level of voltage fluctuations that this protector can cover. 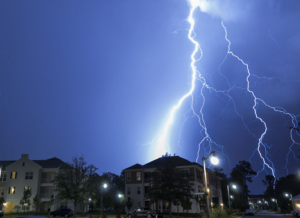 The surge protection acts as a gateway to regulate the level of power running in your home. As soon as the electricity/voltage gets too much, it will shut it off and ground any excess electrical power. All of us can’t be experts in managing switchboards or contractors. Do not manually try to fix electrical boards or electrical sockets as it might lead to electrocutions and – in extreme cases – fires. Instead, hire a certified electrician to change the contractor board and replace it if it’s outdated. In a household, extension cords play a vital role when it comes to convenient wiring solutions. Therefore, it is essential to keep them on the sides and not somewhere where they can be stepped upon. A single misstep can cause a whole host of complications and failures that are better off avoided. It’s common knowledge that water can cause electric shocks when it comes into contact with electricity, but you’ll be surprised as to how many people forget this basic fact. Even something as minor as moisture can lead to major short-circuits, so always be wary of these situations and keep all the electrical switches out of the reach of water. All the steps mentioned above will help you in keeping your home safe from any electrical damage. Recently,installed smart home lighting in our house,and the suggestions are very helpful, Thanks. A major issue affecting the safety of domestic electrical installations is the attempts by householders to repair/modify electrical circuits. These sort of electrical works should be left to a qualified, registered electrician. Some excellent ideas to keep householders safe around electrical appliances/accessories. It is of upmost importance that end user safety, particularly in the residential electrical market, is maintained at all times. Simple ideas like these can help people to stay safe around electricity!